Sales were back on track in February, after a decline in January called the strength of the recovery into doubt. There were 31,007 homes sales recorded in the property register in February (not counting subsidised housing), 17% up on the same month last year, according to the latest figures from the National Institute of Statistics (INE). In total, counting subsidised housing, there were 34,771 sales in February, up an annualised 17%. Year on year, resales were up 25%, and new home sales down 3%. That’s the smallest decline for years, and might be a sign that collapse in new home sales is drawing to a close. 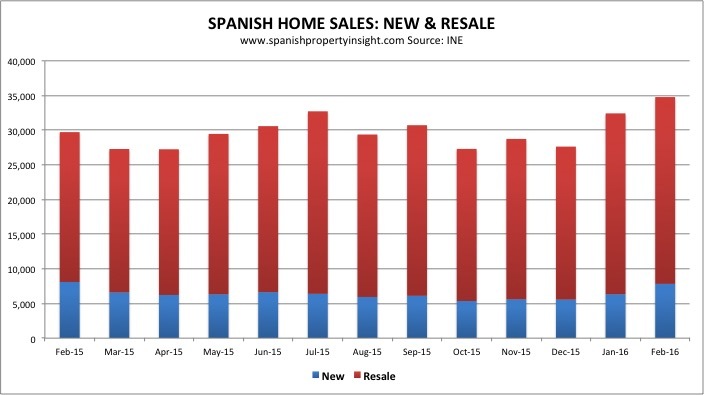 By region, February sales grew strongly in many areas popular with foreign buyers, up 34% in the Balearics, 28% in Murcia and Alicante (Costa Blanca), 26% in the Canaries, 17% in Barcelona, and 13% in Girona (Costa Brava). 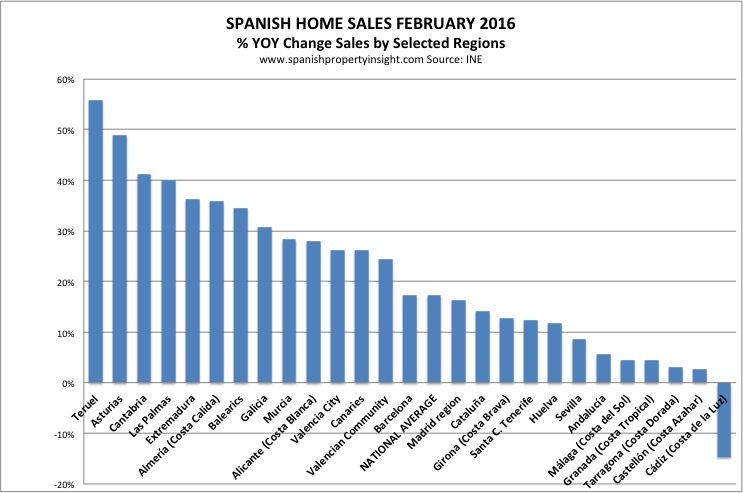 Surprisingly, however, sales were up only 4% in Malaga, home to the Costa del Sol, and fell by 15% in Cadiz (Costa de la Luz). 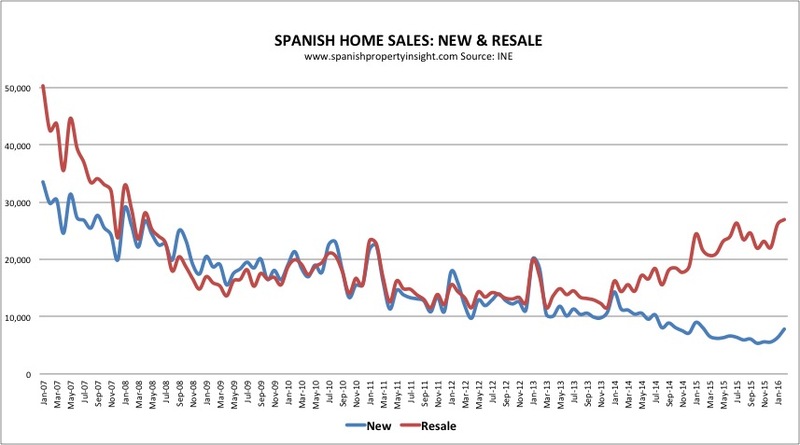 Year to date (first two months), sales were down 11% in Cadiz, 7% in Malaga, and 5% in the Canaries. 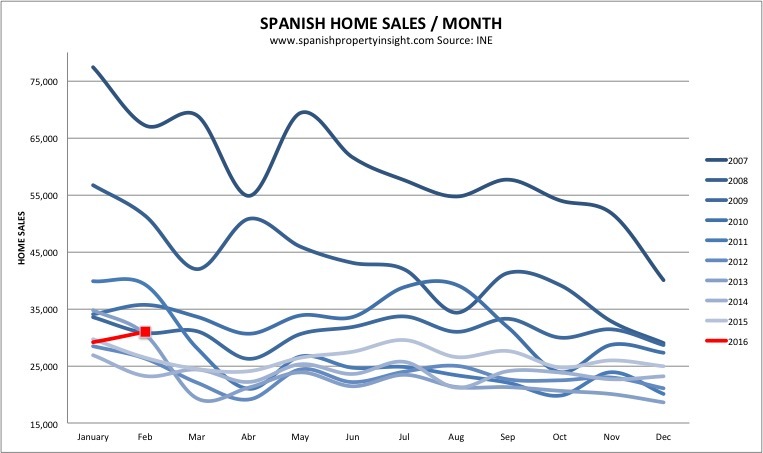 So the overall picture is reassuring for Spanish property market watchers, with sales up by nearly 20%, but sales so far this year have been weak on the Costa del Sol and in the Canaries, both big destinations for foreign buyers.